A concussion (or mild traumatic brain injury) is a complex pathophysiological process affecting the brain, induced by traumatic biomechanical forces secondary to direct or indirect forces to the head. The adult brain is a 3 lb. organ that floats inside the skull. It is surrounded by cerebral spinal fluid which encases the brain in nutrient rich fluids and acts like a shock absorber protecting it from mild impacts. When the brain moves rapidly inside the skull, a concussion has technically occurred. Common scenarios that can lead to a concussion is a direct blow to the head or a whiplash effect to the body. The impact rapidly accelerates the head, causing the brain to strike the inner skull (i.e., the coup). When the head decelerates and stops its motion, the brain then hits the opposite side of the inner skull (i.e., the contre-coup). The second common scenario is a rotational concussion, in which the head rapidly rotates from one side to another causing shearing and straining of brain tissues. In either case, delicate neural pathways in the brain can become damaged, causing micro-neurological and neurochemical disturbances referred to as an Energy Crisis. It is for this reason that brain imaging (i.e., CT Scan, MRI) typically appear normal and do not reveal an injury. A concussion may or may not involve a loss of consciousness (90% of concussed do not lose consciousness) but results in a constellation of physical, cognitive, emotional, and sleep-related symptoms. Recovery is a sequential process and symptoms may last from several minutes to days, weeks, months, or even longer in some cases. A major determinant of severity due to a sport-related concussion is an athlete’s prior history of concussions. Research suggests that if someone has already received one concussion, they are 1-2 times more likely to receive a second one. If they’ve had two concussions, then a third is 2-4 times more likely, and if they’ve had three concussions, then they are 3-9 times more likely to receive their fourth concussion. More seriously, however, is second impact syndrome. Second Impact Syndrome occurs when a second concussion occurs prior to complete recovery of the first. The secondary blow does not need to be severe and often times can be very subtle or mild as the still damaged brain is unable to regulate intracranial and cerebral pressures leading to additional brain swelling. Because the brain is still recovering, irreversible damage may more easily occur leading to long term behavioral and physiological changes. This may be the basis for the Chronic Traumatic Encephalopathy (CTE) seen in many of the professional athletes today. Youth athletes are at greater risk of concussion as the young brain is still developing. The tissue is more susceptible to neurochemical, metabolic changes, the axons are not yet fully insulated or myelinated thus is not as able to recover as quickly as an adult brain. Additionally, the cervical and shoulder musculature is less developed resulting in a decreased ability to absorb mechanical energy throughout their bodies, and they are less likely to use proper techniques to reduce risk. ALL CONCUSSIONS ARE SERIOUS. While a majority of concussed athletes will recover within the first 3-4 weeks some will have symptoms that persist for several months to years and 5-10% will last a lifetime. 3,800,000 concussions reported in 2012, double what was reported in 2002. Only 1 in 6 concussions are diagnosed. Athletes of all ages, participating in sports, are at risk for concussion 65% of concussions occur in children between 5 and 18 years of age. Estimated 53% of high school athletes have sustained a concussion before participation in high school sports. Females are more likely than their male counterparts to sustain a concussion, and they tend to have more symptoms and require more time to recover. Various neuroanatomical and biomechanical differences exist between the genders in sports that could contribute to these differences. Recent research demonstrates that high school athletes not only take longer to recover after a concussion when compared to collegiate or professional athletes, but they also may experience greater severity of symptoms and more neurological disturbances as measured by neuropsychological and postural stability tests. Fewer than 10% of sport related concussions involve a Loss of Consciousness (e.g., blacking out, seeing stars, etc.). 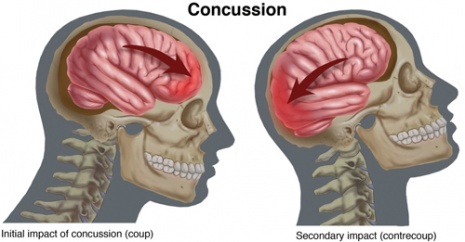 Estimated 47% of athletes do not report feeling any symptoms after a concussive blow. A professional football player will receive an estimated 900 to 1500 blows to the head during a season.